Summary: "Debut novelist Kiki Hamilton takes readers from the gritty slums and glittering ballrooms of Victorian London to the beguiling but menacing Otherworld of the Fey in this spellbinding tale of romance, suspense, and danger. Prince, pauper, and thief—all must work together to secure the treaty…"
First line: "You wouldn't be here pickin' pockets, would you?" 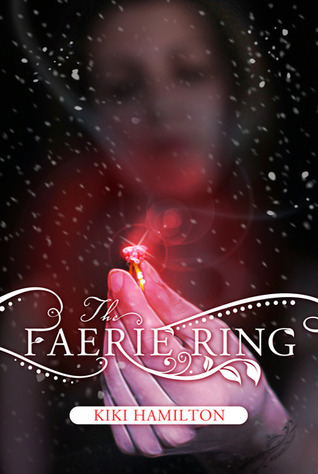 Thoughts: Part historical fiction, part folklore, The Faerie Ring offers readers a glimpse into what life was like in London, during the 1800s, but with the fey. I kind of have mixed feelings about this book. While I easily fell in love with the concept and setting, at times, the story itself did not meet up to my expectations. The Faerie Ring offers everything a reader can ask for (action, robbery, scandal, romance, etc), however, in my case, it does take a while to get there. The pacing in the first half of the book ran relatively slow for my taste. Though there's plenty of action, nothing ever really happened. Things were mentioned and said, a little bit of history here, a little bit more there, but that was it. Also, some of the events felt a little unbelievable to me. An example of this is when Tiki breaks into the Royal Palace. How does one, especially a thief, break into the Royal Palace without being caught? Though crazier things have happened, surely someone would have noticed the out of place girl dressed as a boy. And that's another thing I had an issue with. As teenagers, teen girls have certain unmistakable features that distinguish them from boys. In this book, everyone Tiki (as a thief) encounters views her as a boy, unless her hair happens to fall out or something. If they were younglings, I would completely understand, but has young men and women? No. Furthermore, maybe it's just me, but I really did not enjoy the dialogue in this book. I guess it's because I was trying so desperately to picture these Victorian London characters chatting, but ended up reading their dialogue as slang. Maybe it's because I'm gangsta, fo' sho', but I just couldn't grasp my head around this. I've read other reviews, and no one else seems to have an issue with it, which, again, makes me believe that it's just me. With all this said, lets talk about the second half of the book. Right when I was about to give up, the book takes a complete 180 turn, lures me in and traps me. Finally, something beyond "eat, sleep, steal" happens! Secrets are unraveled and oh em gee, are they good. And the fey! Finally, the fey make an appearance! At this point, I loved how every piece of information slowly beings to make sense. It's quite brilliant, really. Moving on, I want to discuss the two main characters in this book. As the heroine, Tiki rarely ever felt bland or boring. And though she's a thief, she also has her reasons why. Her actions are rarely selfish, and I cherished how she took care of the other kids. There's nothing I love more than a strong female character. Plus, there's the added mystery bonus of what her markings mean. Now, the other character that kept me reading was Rieker. How funny that he always seems to be there when Tiki needs him. There's something about him, a quality, that makes him hard to ignore. It's a combination of his charm and fearlessness. Though there isn't a lot of romance in this book, I still enjoyed the the encounters (even the not so romantic ones) between Tiki and Rieker. They're like a Victorian Bonnie and Clyde, only not evil. Overall, while I didn't love The Faerie Ring, I did enjoy it. Kiki Hamilton created this lush, wonderful world, filled with intrigue and mystery. The premise is great, and there's a fabulous story to be told. All you just have to give it a chance. You hung in there longer than I usually am willing to. I am glad that things turned around and ended up being good. I have it on my TBR but think I will wait until I can borrow it. Great review. This is a must read- destined to be a classic in alternative histories. Truly steam punk / alternative urban fantasy fusion at it's finest! A good, clean book - I am tired of urban fantasies that go way overboard on erotica. This was a refreshing change and I loved the Dickens angle to the plot.